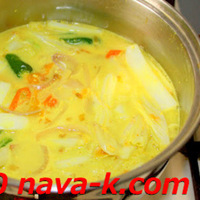 Add all ingredients except and cabbage in a pot. Let is simmer over low heat until just heated through..
Add cabbage and lime juice. Mix and stir cabbage into gravy.